Remember those days when you didn’t want to go to school? Mondays. Rainy days. Exam time. What if they’d told you it was “iPad Day?” You’d be up and atom with your lunchbox, pronto. Teachers at three elementary schools in South Carolina say that thanks to the iPad, keeping kids focused on formerly “boring” subjects isn’t a problem. “We’re golden. I mean look at them. They’re engaged. They are ready to go. They will practice math all day long,” said fifth grade teacher Jennifer Johnson as she handed out iPads to her students for a scintillating lesson on working with decimals. Kids now look out for the gray iPad cart in the classroom (like older generations used to watch for the film projector?) to indicate that it’s going to be fun day. Teachers swear iPads aren’t all fun and games – time on Apple’s magical device is limited and apps are strictly used for lessons. Aside from math, apps like Storykit provide them with less passive learning for subjects like history, prompting them to reiterate the lessons with text and drawings. 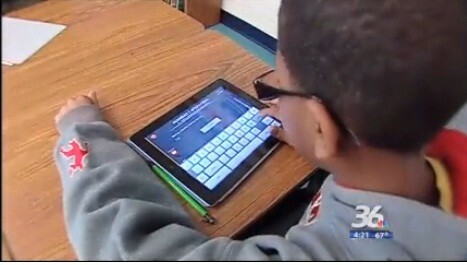 Administrators say the iPads serve not only as a teaching tool, but as a motivator. Staff tell a story of a student who told his parent he “had to go to school” because he knew it was iPad day in one of his classes. “It is neat to see the kids motivated. They just feed off of it. They love it. They’re excited about learning,” reading teacher Megan Charles said.